It has been over 18 months since my last post. That is a confession in itself! Life has thrown a number of stumbling blocks my way and like a fool, I let them distract me from discipline. Last month, I went back to my Bariatric Doctor with my tail between my legs, embarrassed and feeling like a failure. I had reached a weight I said I’d never go back to, ever. And yet there I was, 25 pounds more than my last visit, losing meals regularly and finding foods high in carbs that stayed down. My evening snacking behavior had returned, mostly because I had lost my dinner and was hungry at 8:30pm. The fact that my husband seemed to be able to have evening snacks, including ice cream, made me feel like I deserved it as well. I had 6 months in PT for severe tendonitis in my right foot. For most of that time I was limited to 10-15 minutes of walking. A far stretch from what I had been doing the year before. I gained 20 of those pounds during that time. I had a series of viruses, colds, allergic reactions, new diagnoses like Menieres that mean treadmills and ellipticals are forever banned. My Pilates routine was disrupted by the business moving further away and focusing more on meditation and yoga, in which I have no interest. My running is derailed for a while until my foot has fully healed. Excuses? Well, all these things led to excuses. I’m too tired. There is no exercise I can do. I deserve a break today. And sometime during that pity-party time, I stopped stepping on the scale. Because I cried every time I did. We had a major remodel of our kitchen in 2015, so food preparation was limited. I started choosing foods that were higher in carbs and lower in protein. Someplace in that time, I decided my tea wasn’t sweet enough and had increased my raw sugar intake as well. i was not happy with myself. I had failed, when I said I wouldn’t let that happen! What do you do then? How do you motivate yourself to get out of the bad habits? I guess the same way as before the lap-band. You just decide you don’t like the added weight. Your body reminds you of issues like arthritis that you hadn’t suffered for a while. You look in the mirror and shudder. You try very hard to do a selfie without a double chin. You struggle with buying new clothes, and being comfortable. Sometime last month, things clicked in me and I just couldn’t take the gain anymore. I did go back with my tail between my legs, got some fluid removed so meals could stay down, listened to the nutritionist remind me of good eating habits, and started journaling my food again. What a difference that alone makes! If I’m honest, and journal everything that goes in my mouth, and let my FitBit tell me if I was active enough, my head seems to follow. I’m eating much less. I cut out the carbs of potatoes, most grains and convenience foods. Up with the protein, fruits and vegetables! I’m losing weight again. Did you hear that? I’m going down again! I’m down 12 pounds since last January! That’s a healthy rate, by the way. A few snug clothes are a bit more comfortable. The arthritis pain is already gone. And that encourages me to move more. Then life throws in a few changes. Very high heat index. Upcoming surgery. Visits and traveling. How can I stay motivated? How can I keep from being distracted by these changes? How can I increase exercise? Will I ever be able to run again? I’m not sure I have the answers. I need support from others in the same position. I need to keep my expectations realistic. I need to turn quickly away from a bad habit returning. I need to step on the scale and let it give me the feedback I need. A healthy, active lifestyle is what I need, with no more than 1200 calories a day. I hope my next blog entry is not so far away, with more admissions of failure. I want to stay accountable, even if no one reads this except me. So, about 20 pounds to get to where I was, and then another 20 pounds to get where my doctor wants me. At 2 pounds a month, that is 20 months. I need to be in this for the long haul, that’s for sure! 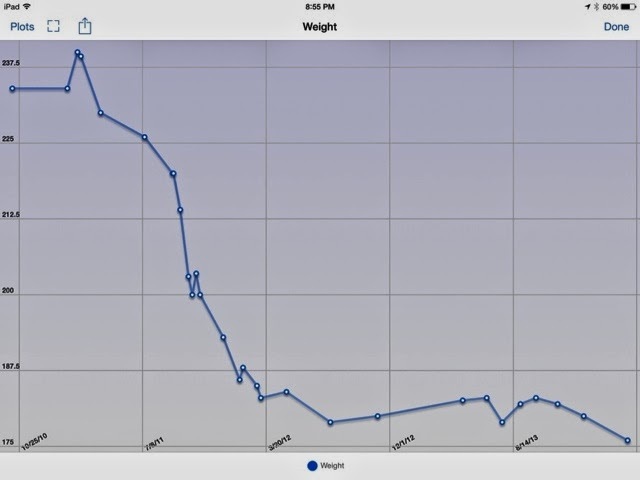 My last post talked about a 15 pound gain after a summer-long illness. Once the meds left my system, I lost half the weight gain. But I’m struggling with water gains and losses in the last two months. I assume I need to be much more diligent about salt intake. Meanwhile, I have tried to get more active, only to be thwarted by the high pollen counts in the Midwest this year. So I’ve had successes, but also setbacks. Allergy congestion means drainage which seems to tighten the band and cause distress a couple of times a week. So I’ve been on ground meats and stayed away from vegetables that can cause me problems. I’ve given up the desire to run 5Ks until next year. I’ve been trying to increase my walking, but I fall very short of my exercise patterns of last spring. So 2014 will not be the year I get the last 15 pounds off. I’m hoping for a hard freeze soon and then maybe an Indian Summer before the cold winter begins. A bit more aggressive walking would be good if allergies can be minimized. I’m reluctant to go in for a band adjustment. Looser would not be good and tightening would likely make more days on liquids and soft foods. So I’m likely in the “sweet spot” with my band. I haven’t posted in a while. Things have been going OK. I hadn’t been losing more weight- the last 15-20 pounds- but I wasn’t gaining. 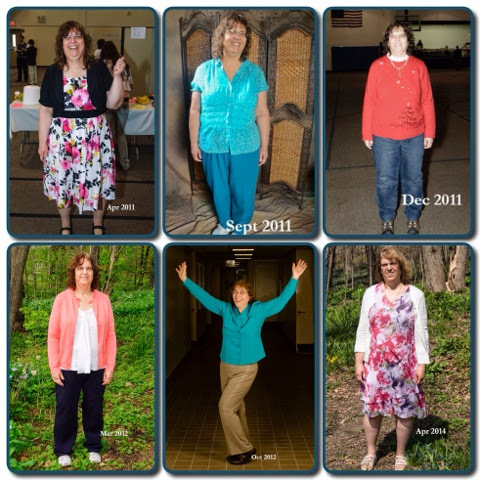 My exercise plan was working- Pilates, walk/run, walking several times a week, and more. Eating had been under control and the Band was working. I went to China of for two weeks and came back from vacation feeling great with no weight gain. Then came the summer cold to end all colds. A month of inactivity, lack of sleep because of meds, restricted breathing that makes even a climb upstairs leaving me tired, and then…a gain of 15 pounds! I can’t do much yet other than start logging my food and watching how much I’m eating. But it will take jump-starting m y exercise plan to begin losing the weight. I’m beside myself. Pollen counts are very high and going outside triggers the restricted breathing. So I have to wait..recover..do the best I can to not gain anymore weight. And. Not. Give. Up!! It usually starts with, “how many pounds have you lost? !” but the story of my journey is so much more than pounds. I am no longer diabetic. My arthritis does not bother me anymore. My blood pressure is almost always in the normal or low range. I can climb, hike, run, jump and not have aching bones, or muscles that are weak. And while my aging body has generated a few new illnesses, they are much more manageable with a lower weight. So what is the whole story, the bigger picture of being a Banded Becky? It started with me collecting photos I’d taken or had taken during my Lab-Band Journey. Then I had to print them. Then I wondered what the charts would say about weight and BMI. Someone suggested that I take body measurements during my journey, but I had never looked at the story the data told. The camera doesn’t lie- unless you get carried away with Photoshop! I did two galleries. The first is as series of full body photos and the second is just my face. The thing is, when I look in the mirror, I don’t see or remember the changes. The photo series blew my mind. Again, looking back over my journey, I knew I had lost weight. I knew I was wearing a LOT smaller sized wardrobe. But the charts seem to exaggerate the loss over the last thee years. I’ve been keeping certain measurements- hip, waist, chest, thigh, calf, bicep, neck, and bra size. How does a total of minus 29 inches sound? Pretty amazing! It does explain why I’ve had to get rid of multiple wardrobes! Going forward, I still have weight to lose. 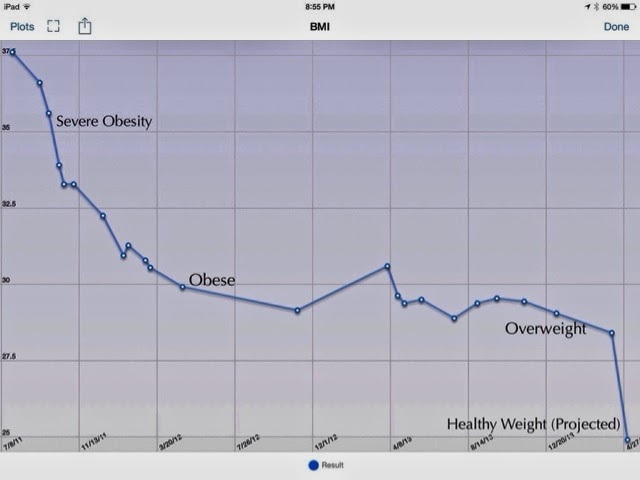 In the BMI chart I added a projected weight in the future where I would be considered at a “healthy” weight. Time is not reflected in the graph! Pounds are harder to lose now, 2.5 years out from surgery. Another 15 pounds off my bones would be great! The title of my blog talks about my journey to a size 12. It seemed an impossible goal five years ago, yet here I am! 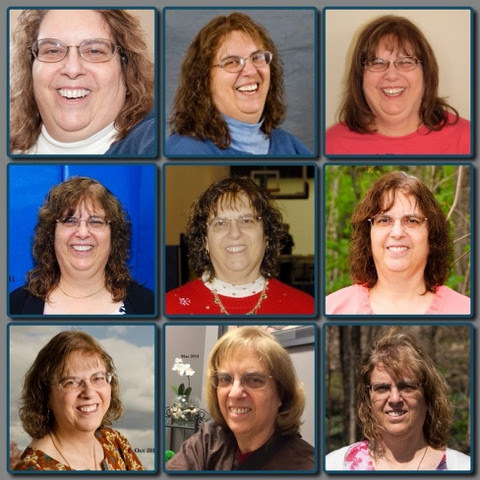 I have lost about 65 pounds since April 2011, which was six months before my surgery. But Lap Bands are forever! I will continue to work to get these last pounds off. But I’ll tell you a secret- I can fit into most size 12 clothes! Sometimes a size 14, sometimes a Medium. But I am almost there! I’m in a holding pattern these days. I’ve had to reduce exercise for what has been diagnosed as Meniere’s Disease, a problem with the inner ear that causes dizziness, nausea and vertigo. It sort of stopped my exercise cold, kept me home for days because I didn’t feel like I could drive safely, and in general, messed up my life for a few weeks. The medications are helping, so I hope after the New Year, I can find some exercise that doesn’t require a great deal of balance or twisting motion! I’ve not have a big appetite during the holidays – now that is something that is good! And it has been a bit easier for me to control over eating simply because most everything people bring to gatherings has dairy – which I can’t eat anymore. (This is NOT related to the Band.) It is a bit easier to say no when you think of the consequences of being sick the next day. I’ve had my moments, but on the whole, I’m within my calorie and quantity goals weekly. All that to say, the holding pattern is in effect, meaning, I’m not losing those last 20 pounds! My journey to a size 12 is a little stalled at the size 14, with some size 12s fitting. So I’m close! I’m certainly healthier. Emotions have not caused me to overeat like they would have in the past. I’m more mindful of what I eat. I eat more slowly than ever before. I still have foods that I cannot eat. So, it has been 27 months since surgery, and at least that long since bread, pasta or rice. Unbelievable! That is what I would have told you three years ago! But you adjust, and the importance of things change when your priorities change. I do get full with less food. I do have to watch what I eat, how well I chew, how fast I eat a meal. This will always be with me. Fast food is not an option for me unless it is a protein bar and fruit, or Wendy’s chili and a side salad. Now ask me if it’s worth it. Absolutely YES!! I can move, run, jump, climb, walk up stairs, bend, and so much more. I don’t have hip or knee pain, or arthritis, no more blood sugar and diabetes, my blood pressure is under control, my cholesterol is managed, and the list goes on. My quality of life is so much improved, that these little inconveniences are just that, little. And I would do it all over again, except I wouldn’t wait as long! My goal right now is to NOT gain those 15 pounds during the winter like I did last year. I am just less active in the cold weather. So January, if the dizziness is under control, I need to find ways to move that burn calories and don’t mess up my inner ear. Allergy Season is limiting my exercise! It’s hard to believe, but its been over a year since I posted. So much has happened, I can’t possibly catch up! A brief overview: I stayed at a plateau for over six months. Then in the winter, I gained 15 pounds. Argh! I need a plan for this winter to keep up the exercise routine. I’ve also had a few non-weight loss health issues that have changed which exercises I can do. I did run a 5K 4th of July and once again participated in the Mayor’s Fitness Challenge of posting minutes of activity each day for 8 weeks. I did loose the 15 pounds and my doctor wants me to loose the last 20 that would take me to the top of the range for my height. My current drama is an ear infection that makes me dizzy. A minor set back to my exercise plan! Being outside during Chicagoland’s high allergy season is keeping me inside. My lungs do not like the pollen! So what is a bander to do? Pilates, mall walking, and I’m open to other choices! I haven’t been willing to try exercise classes at the Park District because I didn’t know if I could keep up, but I may have to to get some calories burned! I have continued to do my run/walks. As soon as the first freeze, I’ll start again. Exercise continues to be my challenge. I get busy, find excuses and get bored. I feel great after, can do so much more, like run, hike up mountains, run up stairs, but yet I fall into old habits. When I get myself focused and develop a plan, I get sick or have a family emergency and have trouble kick-starting the exercise. Any ideas out there? 1. Find something to keep the sweat out of my eyes. 2. Gotta get clothes that are a bit less in coverage, more absorbent, and thus, less hot! 3. Make sure my iPhone is charged so I can use those nifty Apps like Runtastic Pro and Heart Rate and to be able to make a call if I need to! 4. Get air in my bike tires so I can ride my bike! Which is what I had planned to do this morning. 5. Consider sunglasses and a hat. 6. Do something about that left hip! 7. There is a noticeable difference having the insoles in my running shoes! I won’t make that mistake again! It was successful today. I had a 200 calorie bar that had both protein and carbs in it for breakfast. I got a good 2 glasses of water in before I went out and took 2 more with me which I drank while I was out. I had an early lunch after a shower. I walked for 5-10 minutes and then stopped to stretch. When I got home I did several stretches for my legs. My Striiv says I burned 650 calories. Not bad. I signed up for the Firecracker 5K on July 4th here in Warrenville. It is a walk/run, so I think I’ll be fine. It is more to do it and finish that drives me. It will be my first! I’m excited about those changes. I have no idea where I’ll be going with it. I’m not sure I can see myself running in winter. Time will tell!